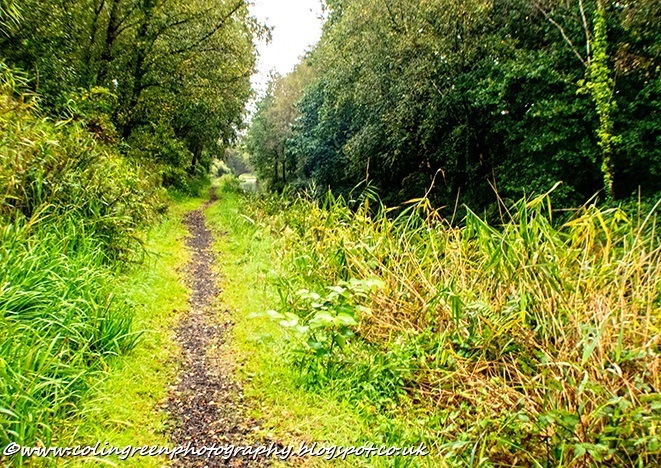 Colin Green Photography: Neath and Tennant Canal, South Wales. Neath and Tennant Canal, South Wales. The Neath and Tennant Canal are 2 independent but linked canals in South Wales. The section I was close to what the Tennant stretch of the canal running past Neath Abbey Business Park. The following info has been taken from Wikipedia as I know nothing about the canal but happened to be close by with time to kill. George Tennant, born in 1765 and the son of a solicitor in Lancashire, moved to the area in 1816, after he had bought the Rhydings estate. The Glan-y-wern Canal was unused at the time, following Lord Vernon's distraint, but Tennant, who had no previous experience with canals, decided to lease it, enlarge it and extend it. He planned to make it suitable for barges of 30 to 35 long tons (30 to 36 t), which would gain access to the river Neath through a lock at Red Jacket. Where the canal turned northwards across Crymlyn Bog, he would extend it to the west, to terminate at a lock into the River Tawe, near Swansea harbour. He believed that Swansea docks would provide a better shipping point than Neath or Giant's Grave, and hoped that the canal would encourage the development of the corridor through which it ran. He attempted to gain support for the scheme from local landowners, but when none was forthcoming, he decided to fund the project himself. Lord Vernon's estate had been inherited by the Earl of Jersey in 1814, and so Tennant leased the Glan-y-wern Canal from him. Work started in 1817, under the direction of the engineer William Kirkhouse, and the canal was completed by autumn 1818, running from near the east pier on the River Tawe at Swansea to the River Neath at Red Jacket. The canal was built to a grander scale than originally intended, and could be navigated by barges of 50 to 60 long tons (51 to 61 t). The main line was 4 miles (6.4 km) long, and the 1.4-mile (2.3 km) branch to Glan-y-wern was also reopened, for it supplied regular cargoes of coal. Other goods carried included timber, bark, fire-bricks and sand, but the volume of goods carried was not enough to make a profit. He negotiated with the Neath Canal, who gave him permission to build a lock into the river from their canal, either at Giant's Grave or Court Sart pill, but working canal boats across a tidal river would not have been ideal, and he did not build the lock. Instead, he decided to build an extension to link up with the Neath Canal basin at Aberdulais. Again he sought support from local landowners, including Lord Jersey, Lord Dynevor and the Duke of Beaufort, but again none was forthcoming. He decided to build it as a private canal, without an Act of Parliament, and work started in 1821. Engineering problems were experienced near Neath Abbey, where a 500-yard (460 m) cutting was required through what appeared to be quicksand. Eventually, an inverted masonry arch had to be built to contain the canal and stop the sand collapsing. The lack of an Act to authorise the canal proved to be a problem in April 1821, when L. W. Dillwyn refused permission for Tennant to cut through his land to pass under the Swansea road. In February 1822, Dillwyn obtained an injunction against Tennant, who then attempted to change Dillwyn's opinion by sending a stream of important people to argue his case. Finally, in the autumn, Tennant offered the Neath Canal terms for the use of the junction which were so favourable to them that they accepted. Dillwyn, who was a Neath Canal shareholder, was sent a conciliatory letter and eventually agreed to negotiate with Tennant, whom he described as "that terrible plague Mr. Tennant." The final section included the only lock on the main line, which was followed by a 340-foot (100 m) ten-arched aqueduct across the River Neath, and the junction with the Neath Canal. The total length of the canal, when it was opened on 13 May 1824, was 8.5 miles (13.7 km), and it had cost around £20,000, which did not include the price of the land or of the harbour at Port Tennant. At the Swansea end, Tennant built a sea-lock, so that boats could enter Fabian Bay, and named the area Port Tennant. His terminus was destroyed when the Prince of Wales Dock was constructed by the Swansea Harbour Trust in 1881. It occupied all of the area which had been Fabian Bay, and so a lock was constructed to enable boats to reach tidal water by passing through the dock, and a wharf for the canal was constructed at the eastern end of the dock. Tennant's wharf was again destroyed in 1898, when the dock was extended. Wharfage was provided for the canal along the entire southern side of the extension, but no lock was built to allow canal boats to enter the dock, even though the Act of Parliament made provision for one. A new branch of the canal was built in 1909, which included a lock into the newly constructed Kings Dock, where a lay-by berth was provided on its north side. Prior to its opening, Tennant estimated that the canal would carry 99,994 tons per year, and generate £7,915 in income. Traffic built up, and by the 1830s, annual tonnage was around 90,000 tons, but revenues were less than anticipated, and produced a profit of about £2,500 per year. Initially, it was known as the Neath and Swansea Junction Canal, but by 1845 it had become known as the Tennant Canal. The water was 5 feet (1.5 m) deep between Red Jacket and Aberdulais, and 7 feet (2.1 m) deep from Red Jacket to Swansea harbour. This provided a large reservoir of water, which was used to scour the tidal basin at Port Tennant. Boats typically carried 25 tons, which allowed them to work on the Neath Canal as well. Several short branches were built, including one to the Vale of Neath Brewery which opened in 1839 and was privately funded by the brewery. In the same year, the Glan-y-wern Canal was dredged and re-opened. Goods carried were mainly coal and culm, but also included timber, iron ore, sand, slag and copper ore, with smaller amounts of foodstuffs and general merchandise. Establishment of industries at Port Tennant, which included Charles Lambert's copperworks in the 1850s and a patent fuel works in the 1860s, resulted in increased traffic of coal, from both Glan-y-wern and Tir-isaf collieries. Tir-isaf was served by a 1-mile (1.6 km) branch built in 1863 by the Earl of Jersey, but leased to the Tennants. Traffic figures reached 225,304 tons in 1866, and then gradually declined after that, but this provided a steady revenue until 1895. The river lock at Red Jacket had a chequered history. Once the line to Aberdulais basin had been opened, it was barely used, and Tennant thought about removing it in 1832. However, it was back in use some time later, and was unused again in the 1880s, only to be rebuilt in 1898. I will remove this if Wikipedia requests it. There are 2 albums of pictures available to view, one of 10 on Flickr full size or by the arrows on the picture below. The pictures were taken using a Nikon d3300 SLR on a wet early autumn evening on the 20th September 2017. The 2nd album of 7 pictures are available exclusively to Clickasnap and can only be seen by clicking the link below the picture. Click here to view the full Album of pictures of the "Neath And Tennant Canal" on Clickasnap. There are 7 pictures there to view and each picture viewed on Clickasnap for over 10 seconds results in the photographer receiving a small contributors fee to help support there photography. The pictures on there are full size, resolution and without any watermarks.